New Yorkers pride themselves on playing it cool with celebrities; to stroll past Beyoncé and baby Blue Ivy without breaking stride is a badge of honor. So when our hometown chefs nab screen time, it’s customary not to fawn. In a city brimming with kitchen rock stars, it takes a lot more than a Food Network show to attract attention. 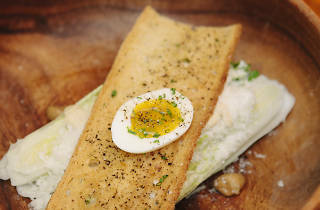 At American Cut, Iron Chef Marc Forgione isn’t turning heads so much as laying down a safe bet. 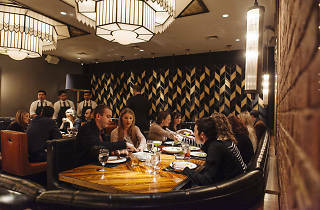 Unlike his other recent debut—Khe-Yo, the city’s first Laotian hot spot—his brassy Tribeca steakhouse delivers more of the same to a city already pumped up with marbled meat and Barolo. A spin-off of his Atlantic City original, it’s a playpen for high-rolling carnivores, suffused with wafting scents of singed fat and smoke-laced bourbon. The vast Art Deco space glimmers and glows, with shiny inlaid marble below, and brass chandeliers above. Burnished rosewood tables big enough for a poker game await hedge-funders eager to go all in on beef and booze. The menu caters to lily gilding, inviting you to top any of its wet- or dry-aged steaks with bacon ($6), foie gras ($18) or an entire Singapore-style lobster ($27). If you’re keen on embellishments, you’ll want the bone-in rib eye that’s Katz-ified into a smoky, spice-crusted pastrami steak topped with caraway butter ($44). Simplicity also earns its keep in this temple of gluttony. 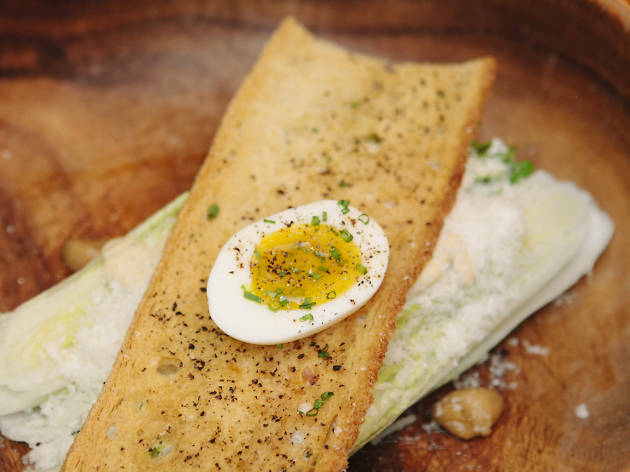 Chopped tableside, Caesar salad ($14) inspired by the Tijuana original impeccably balances sharp Parm and creamy yolk. 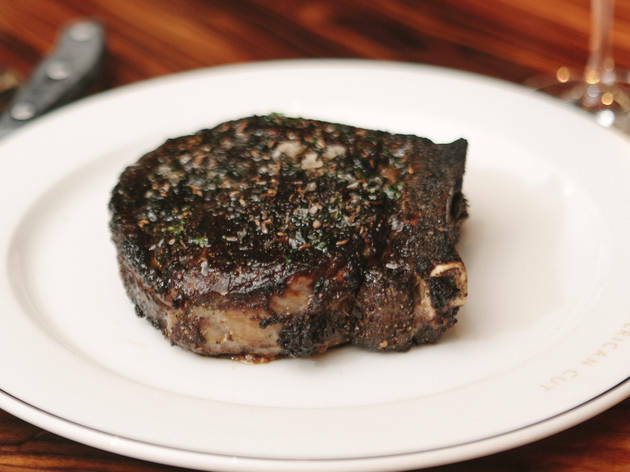 An unadorned Creekstone rib eye for two is striped with quivering fat and cloaked in a Maldon-flecked char as spectacularly crunchy as a Pringle. 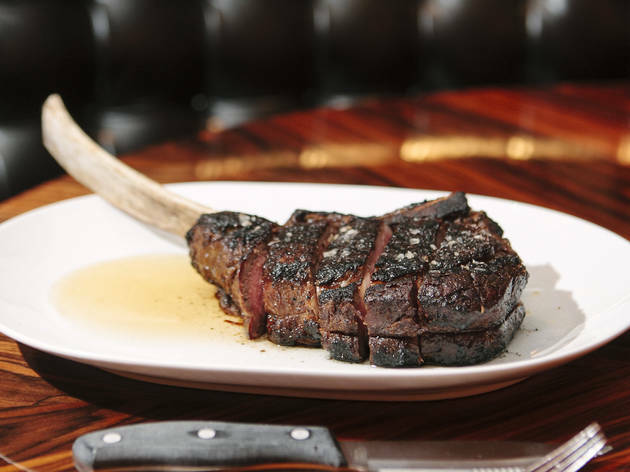 The steak joins Forgione’s signature hairdo as one of the better tomahawks in NYC, but at $135, it better. Mostly underwhelming sides sometimes show the grace of modesty in a restaurant dripping with excess. 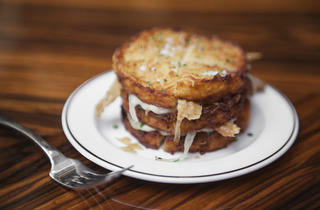 Thinly sliced potatoes ($10) forged into a fancy brick are dressed with dry-aged beef fat and lardon. 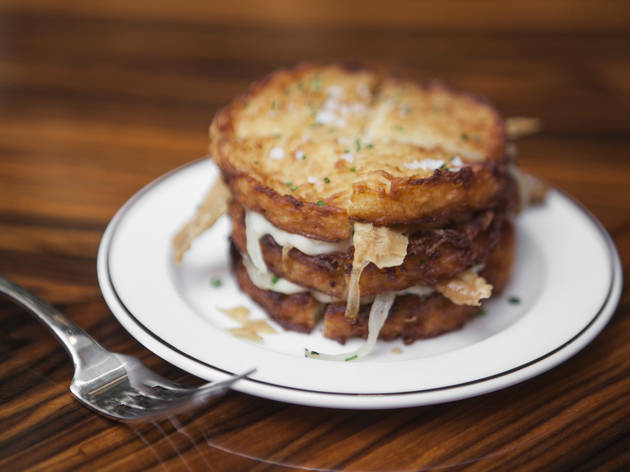 But the showy spuds aren’t as good as a humbler stack of crisp, tender latkes ($10) scattered with shards of fried chicken skin. With its swaggering more-is-more ethos, American Cut gladly fosters the kind of reckless machismo that leads to wicked hangovers and a tinge of buyer’s remorse. Its fat-wallet fare offers some decent payouts, but in the end, a meal here feels like paying for a trip to Vegas and winding up in Atlantic City. Behind the bar: The cocktail menu features amplified takes on classics, like a Negroni in which each component is aged in a wine barrel, or the signature old-fashioned whose glass is infused with maple smoke. Cocktail chatter: Custom chandeliers modeled after the Chrysler Building scream Art Deco, while black banquettes inspired by Sid Vicious’s leather jacket add rock & roll undertones. Loved the TriBeCa location. Kindof romantic but business and it's all about the meat. You have to get the house classic Pastrami seasoned steak. 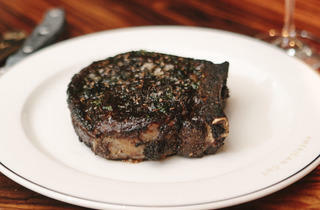 I WAS happily surprised as I love a classic ribeye. The inventive Asian twists come with the Lobster in spicey tomato broth and the Wild mushrooms were on grits that were the best I e had outside of Charleston. Dessert~ foie gras! Had dinner with family here and was pleasantly surprised. I figured we'd need to wait for a table, but we were seated right on time! I ordered the Hanger Steak, which was to die for! We had also ordered the Bacon Appetizer which was delicious as well, plus dessert of course. Well I am not quite sure why this amazing steakhouse has been given an average mark by Time Out. Perhaps because American Cut was visited by Time Out in 2013- they need to revisit. I live in London and try to visit New York at least once a year, so far I have done so in the last three years. I first went to American Cuts in 2014 and then again during October 2015. On our last visit I ordered the New York City cut (medium rare) and my husband and I shared a twice baked NY cheddar truffle and the most amazing carrot I have ever had (EVER)- the Carrot Glazed Carrot (Mint. Maldon). 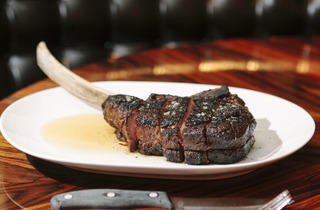 Next visit I will again go to American Cut, my fav of all the steakhouses I have visited in New York. 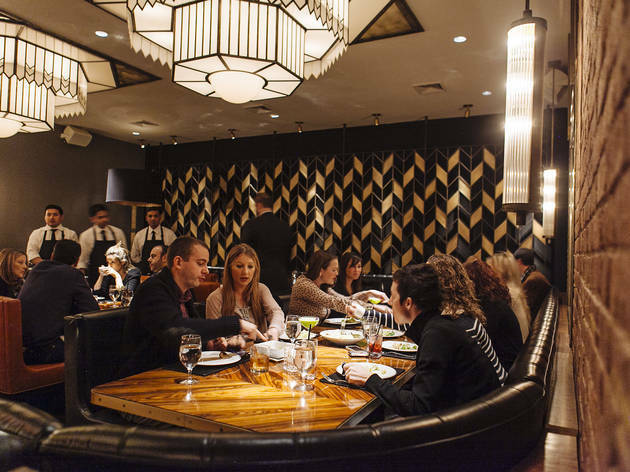 A lot of things stand out here - the sleek retro-luxe atmosphere, the exceptional food quality, the dedicated wait staff, and the full service bar. To start the old fashioned really is an experience, and is really done right. The food is fantastic (assuming you eat large portions of red meat), and the sides/appetizers/sauces, etc. serve as delightful accompaniments. The wait staff, decor, and atmosphere were all on point, everything was clean and inviting and it was an incredibly enjoyable, and expensive dining experience. Delicious food ... Awesome service . Love the steaks at American cut their absolutely amazing very juicy an well prepared also the service is outstanding along with a great fine dining experience!